The annual winter outing to Ten Mile River is never short of fun activities! The new twist this past year was the attempt to go snowshoeing–something most scouts have never done. Unfortunately a warm front in the week leading up to the event resulted in most of the area snow melting. 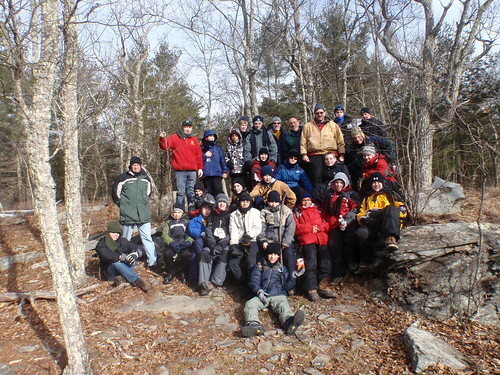 By Saturday morning, it was well below freezing again and our snowshoeing guides ended up taking the boys on a brisk 5-mile hike, where scouts found both interesting ice formations as well as spectacular views of the Delaware River valley. The afternoon was reserved for the traditional ice fishing adventure, courtesy of long-time troop friend Ray Lewis. Mr. Lewis brought the gear, the bait, the augur and the cheerful encouragement! Though the fish were not biting, the boys entertained themselves on the thick slippery ice by sliding around in chairs from the cabin. The traditional Thanksgiving-style meal and a good night’s sleep capped off another fun winter playland weekend for the scouts. Check out the photos here.